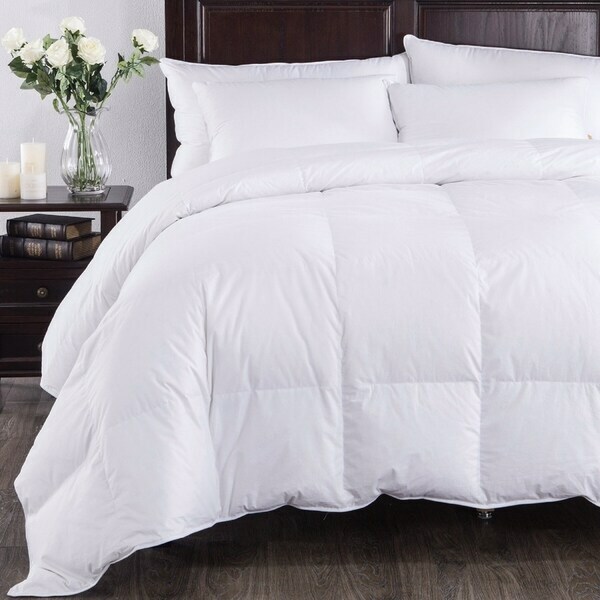 The white down comforter provides you with a heavenly sleeping experience with its 100% cotton fabric and natural fill. The sewn box construction helps keep the 75% white duck down and 25% white duck feather fill in place. Perfect if you like to change up your style, with corner loops to keep you favorite duvet cover in place. Comforter is made from 233 thread count 100% cotton fabric. Filled with 75% white duck down and 25% white duck feathers. Spot Clean, Dry Clean Recommended. Made in China. Dimensions 88.0 In. X 68.0 In. X 3.0 In. This order fulfilled all my expectations,especially for the price. It has ample filling and the sizing is great. It looked great in the picture but I found it to be flat when I took it out of the package. It didn't look very appealing to me at all. After It was laid out for a day or so it became full and fluffy, looking better than the one in your advertisement. I am very pleased with it and will recommend it to my friends. The only reason I'm giving 4 stars is because the material is noisy. Sounds strange but as you move it around, it makes a lot of noise. The fabric is slightly stiff and heavyweight. But I love the comforter otherwise, very warm! Many years ago I had a similar basic white, down comforter that I could launder in my washer & dryer (it was not on the instructions, I just decided to do it after seeing an online chat about it)...BUT, I tried it on another down comforter and it was a disaster - the tiny feathers started poking thru the fabric and were on everything! Had to have a lint roller handy for clothing, headboard...ugh. I haven't decided whether to attempt it with this new comforter. great comforter! not heavy at all, but keeps us very warm! Love it! Yes, this comforter does have corner ties to secure a duvet cover.